The compact and cost-effective G5 is a breakthrough. This 3.5” LCD screen fits in a standard 3 1/8” instrument hole and is more than a backup – it’s a standalone primary instrument for heading and course information. Far more reliable than vacuum-powered instruments, the built-in battery means G5 will continue to operate even if your electrical system should fail. Connect to your GTN or GNS series navigator and the G5 can also display VOR/LOC/GPS information. It will even drive popular autopilots made by Bendix/King, S-Tec, and Century. Approved for use in IFR and VFR flight. 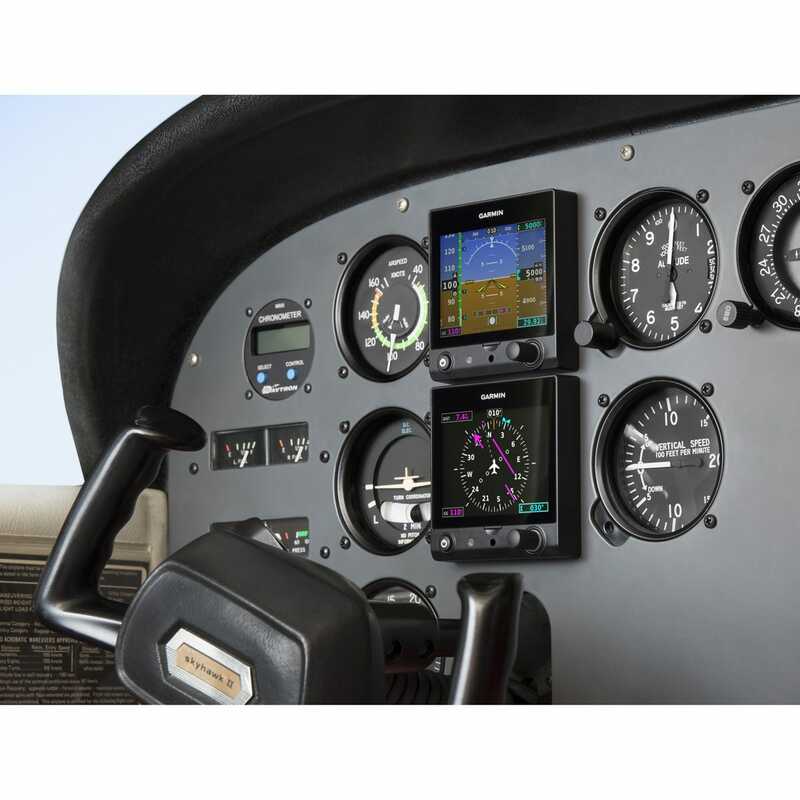 The G5 electronic flight instrument offers a wide range of flexible panel configuration options along with the reliability associated with a modern electronic flight instrument. 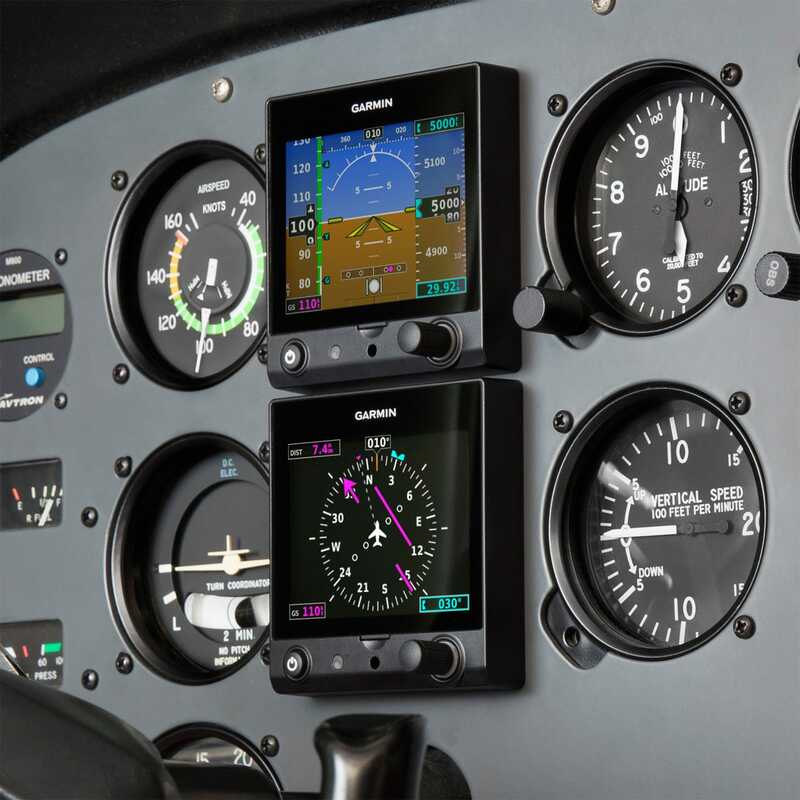 Up to two G5 displays can be incorporated into a single aircraft panel in several approved combinations, including the attitude, DG/HSI or turn coordinator positions. In dual installations, a secondary G5 can revert to display attitude information in the unlikely event of a failure in the primary attitude indicator position. A pilot-selectable menu on the G5 DG/HSI enables the manual selection and interchange between the attitude indicator and DG/HSI display. Utilizing the new GAD 29B adapter, the G5 directional gyro (DG)/horizontal situation indicator (HSI) can interface with a variety of autopilots to provide heading and course error to drive the autopilot. With a compatible navigation source, the G5 can also interface with select autopilots for coupled flight in heading and navigation modes. Additionally, when interfaced with a GTN 650/750 or GNS 430W/530W, the G5 can provide GPSS roll steering navigation from the navigator to the autopilot. Pilots can simply select GPSS on the G5 and heading mode on the autopilot and the autopilot will fly smooth intercepts, holding patterns, procedure turns and more. I assume the DG/HSI requires it be connected to a navcom radio. Are only Garmin nav/comms compatable and if so what nav/comms are compatable? Does it work with only GNC or GTR models or will it also work with an SL 30 or SL 40? BEST ANSWER: These units are not required to be connected to a NavCom. Please see Garmin.com for compatibility. Will the G5 be compatible with my 1977 PA32 Altimatic III autopilot? will the two g5's work with the GFC 700 autopilot? BEST ANSWER: The G5's will not work with the GDC 700 autopilot. 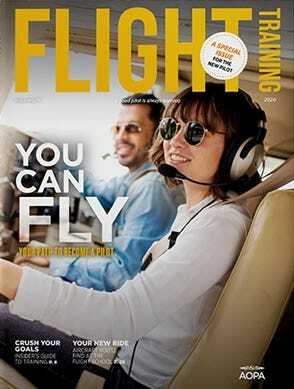 I have Cessna 182 Will the dual garmin g5s talk with the new garmin GTN 750 and the Stec50 auto pilot ? With 2 G5 installed, can I remove the vacuum pump? BEST ANSWER: Yes, the pump can be removed. What is the cost of installing 2 G5 in C182 with GTN 650 already installed? BEST ANSWER: Approximately 35- 38 hours. Are the G5 Horizon and G5 HSI available for immediate purchase? BEST ANSWER: Yes, we have both in stock. Does the install kit in the battery come with this because I see you have them separately on your item list? BEST ANSWER: The install kit and battery are included with certified units. Is the G5 DG/HSI certified for helicopters? BEST ANSWER: It is not certified for helicopters yet. I have the Garmin G5 (experimental) and am looking for the GMU 11 magnetometer to install with it. Garmin part number is 010-01788-00. every time I search it on your website it comes up with an HSI which I don't need or want. Garmin list this part number as an accessory to the G5 and MSRP is 275.00. Can you get this part or do I need to look elsewhere ? BEST ANSWER: We do not sell the GMU 11 separately. Please contact Garmin. Can this pair of Garmin flight instruments IFR qualify an otherwise VFR certificated plane? 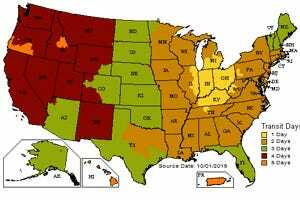 BEST ANSWER: I would recommend talking to your local flight services district office (FSDO) or your local avionics shop. Does this have a heading bug that will "talk" to an S-TEC 40 autopilot? BEST ANSWER: The Garmin G5 will not "talk" to a S-TEC 40 autopilot.